Chelsea Clinton announced that she is pregnant during a speech in New York City with her mother, former Secretary of State Hillary Clinton, at her side. 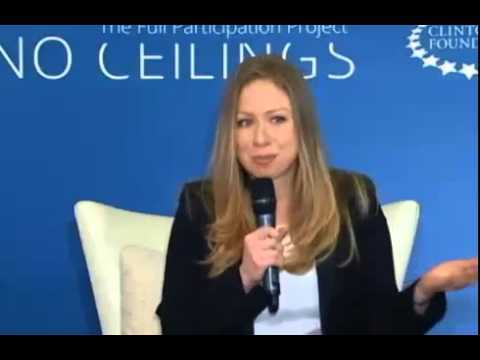 “Marc and I are very excited that we have our first child arriving later this year,” Chelsea Clinton said at the Lower East Side Girls Club at the end of a Clinton Foundation event dedicated to empowering young girls. Chelsea Clinton, 34, did not say if she and her husband, Marc Mezvinsky, are having a boy or a girl. However, Chelsea Clinton later tweeted that her due date is sometime this fall. “I certainly feel all the better whether it’s a girl or a boy that she or he will grow up in a world full of so many strong, young female leaders,” she told the audience full of young women. Hillary Clinton connected the announcement to the focus of the day’s event, telling the crowd that she is not only excited for her family but for the future generations who may not have to face the same glass ceilings as she did. “Obviously we are very excited about what’s happening in our family,” Hillary Clinton told the young women. Chelsea’s parents, Bill and Hillary Clinton, both responded on Twitter shortly after the announcement Thursday afternoon. Kim Novak on Oscars 2014: "I was bullied!"